EXPERIMENTAL – INNOVATIVE – INTERNATIONAL. For singers who want to increase their potential. The European Overtone Choir is a project choir to sing along. We offer a week of rehearsals with the final concert once or twice a year. The cast consists of the respective participants and is new in every project. Each of the weeks can be booked individually. We sing mostly from scores. Some pieces are composed conventionally, others require overtone singing of varying degrees of difficulty. Simple overtone parts can easyly be sung by every choir singer without any prior knowledge. Singers without overtone singing experience can either learn basics of overtone singing in the afternoon workshops or sing without overtones. More experienced overtone singers are given the opportunity to rehearse more complex overtone compositions in a chamber ensemble or to sing solo parts. The overtone based work on the timbre and the vocal tuning plays a central role in the rehearsals and in the workshops. The aim of the choir is the development of the vocal sound of each singer and the whole choir sound. 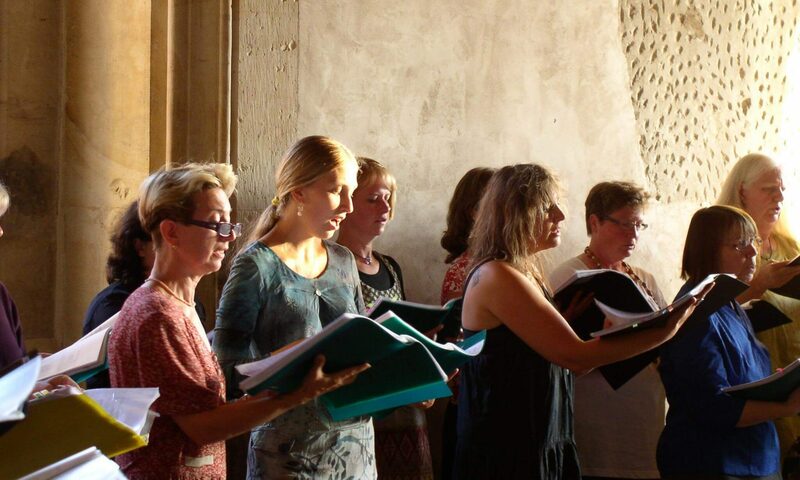 Characteristic of the choir is to experiment and to explore the limits of voice. The rehearsal of the pieces is therefore only one aspect of the choral work. Through daily intensive study of the overtones, attendees will gain an entirely new approach to their voice and to their way of listining. Just intonation and tone color in the light of the overtones get a new practical and intuitive meaning.